QUANTITY - Package comes with totally 100 pcs assorted color sewing zippers that are enough for your daily family or craft use. MATERIAL - These zippers are made of nylon that are strong and sturdy to use. SIZE - All the zippers are about 9.4" in full-length and about 7.7" from bottom to the top of the zipper. USING - These nylon zippers can be used for making or fixing clothing, bags, pet clothing, pouches, wristlets, and other craft projects. 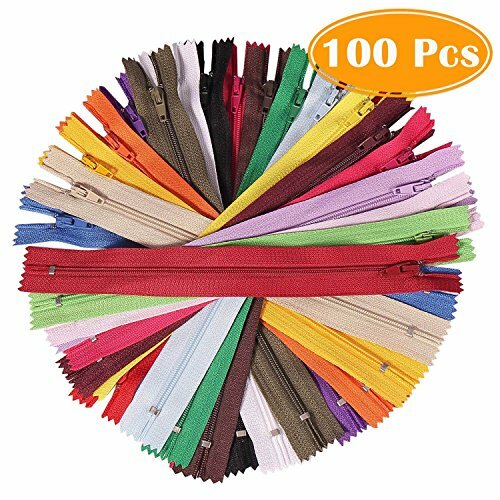 COLORS - The zippers include 20 colors x 5 pieces zippers. Colors are as follows: coffee, white, beige, golden yellow, claret, black, light green, army green, light pink, light purple, orange, blue, hot pink, bright red, purple, green, light blue, yellow, Red brown, light grey.